MacKenzie Commercial Real Estate Services, LLC is pleased to release their 1st Quarter 2016 Industrial Market Report for the Baltimore Metropolitan Area which includes the following overview from renowned economist, Anirban Basu of Sage Policy Group. 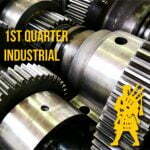 To view MacKenzie’s complete industrial report, please click here. First quarter net absorption in the Baltimore regional industrial market was strong. Nearly 1.8 million square feet of warehouse space was net absorbed during the year’s initial three months, a reflection of strong Port-related activity, an economy driven largely by the movement and purchase of consumer goods, and greater urgency among lessees in the face of declining vacancy rates. Warehouse space absorption was most pronounced in the BWI Corridor, Baltimore City, and in Baltimore County East, which collectively net absorbed approximately 1.4 million square feet of space. Vacancy rates continue to tilt lower. In the BW Corridor, for instance, vacancy has dipped from 11.2% to 10.1% over the past year. In Baltimore County East, vacancy has declined from nearly 16% to 14.2%. However, in a handful of submarkets, warehouse vacancy has actually risen over the past year, including in the Harford/Cecil submarket (6.3% to 7.5%). Accordingly, overall regional vacancy has barely shifted over the past year (8.4% to 8.3%) and average asking rents have hardly budged ($5.02/sf to $5.14/sf). For its part, the region’s flex market registered positive net absorption of 247,368 square feet during the 1st Quarter 2016, helping to bring vacancy down into the single digits (9.7%). Baltimore City led the way, with nearly 129,000 square feet net absorbed during the quarter. This is one of many indicators suggesting that the city’s economy is coming back to life. Regionally, average asking rent has grinded higher over the past four quarters, from $11.18/sf during the 1st Quarter of 2015 to $11.33/sf one year later. Recent national indicators of retail and manufacturing activity have been reasonably upbeat, suggesting that the ongoing economic recovery remains firmly in place. With the dollar weakening and the Port of Baltimore continuing to reap the benefits of recent investments and upgrades, the Baltimore regional industrial market is positioned to remain active in 2016.